The inspiration for this look comes from springtime gardens in Provence. Rolling fields of wild lavender as far as the eye can see. Multicoloured tulips dancing around in the wind. Rustic tones scattered across the French countryside, rich clay roofs, wrought iron fences and cobblestone paths. It is an image that conjures up day dreams of afternoon bike rides through fields of wild flowers and sipping white wine under the shade of a giant oak tree. This sense of rustic romance is what I had in mind when putting together this look. When I saw the print on this Alice &amp; You midi dress, it fit perfectly into my dreams of French pastries and fields of flowers. I love how unique the print is, dainty yet rustic. It plays so well into the cut of the dress. The cap sleeves and V-neck add romance to the overall feel of the dress and the A-line fit of the dress, which includes a flowy hem, dances whimsically in the wind. I unfortunately purchased this dress in a size too big, which caused the fit to be slightly off. To fix the over plunging neckline and loose waist, I used a skinny black belt I had in my closet and secured it around the narrowest part of my waist. I then pulled the dress over the belt, adding layers that make the dress even more exciting! I decided to go neutral with the accessories because the gorgeous print of the dress was bold enough to hold its own. This bonded shopper bag from Asos was the perfect fit. It is simple and elegant with a bright orange inside liner that makes my inner colour fiend smile. 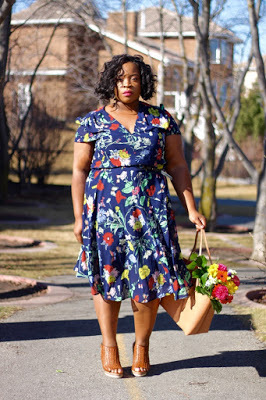 Paired with these New Look wide fit Sandals (which fit like a glove and will be a huge staple in my wardrobe this Spring season) and a bouquet of fresh flowers, this look transports me to my French Countryside dream!